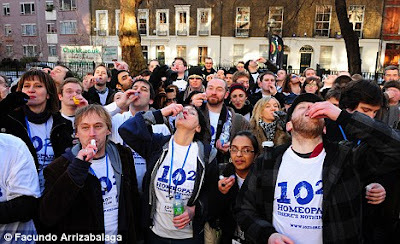 On January 20, 2010, at 10:23 (Oxford time, we may suppose), thousands of brilliant minds tried to prove, by guzzling homeopathy pills, that homeopathic remedies could not kill people, and thus that homeopathy doesn't work (and that "there's nothing in it"). A magnificient demonstration of public adherence to the scientific method! Almost all of the systematic reviews in conventional journals start on a skeptical note. Indeed, nine out of ten of the articles begin with a statement that questions the scientific plausibility of homeopathy. Some of the articles use relatively strong language to make the point. For example, one by ‘Ernst and Pittler’ suggests that it is the use of ‘highly diluted material that overtly flies in the face of science and has caused homeopathy to be regarded as placebo therapy at best and quackery at worst’. This is a stunning demonstration of the lack of intelligence not only of the ‘scientific consensus’, but of the democratic process of knowledge itself. And leading the process is Wikipedia, which turns donkeys into horses on a daily basis, as Socrates would say, while in the background is the poor state of debate between the Orthodoxy and the scientists and philosophers who are trying to make sense of homeopathy. Hahnemann spoke about a ‘forc’ that remained after dilutions and succussions, but pseudoskeptics have kept making the same strawman argument for the last 200 years. You may not agree, but it is not foolish stuff. Indeed, these days, the ‘homeopathic force’, for instance, could be described in a context of systems biology. According to Ilya Prigogine, a Russian-born Belgian chemist best known for his definition of dissipative structures ‘and their role in thermodynamic systems far from equilibrium’(work that led him being awarded the Nobel Prize in Chemistry in 1977), in the domain of deterministic physics, all processes are time-reversible, meaning that they can proceed backward as well as forward through time. As Prigogine explains, determinism is fundamentally a denial of the arrow of time. With no arrow of time, there is no longer a privileged moment known as the ‘present’, which follows a determined ‘past’ and precedes an undetermined ‘future’. Instead, all of time is simply a given, with the future just as determined as the past. With irreversibility, the arrow of time is reintroduced to physics. Prigogine notes numerous examples of irreversibility, including diffusion, radioactive decay, solar radiation, weather and the emergence and evolution of life. This applies especially well to homeopathy. Orthodox scientists evaluate homeopathy through the lens of the results (it’s only water/alcohol!) and tirelessly calculate oceanographic metaphors to deride what they believe is homeopathy, oblivious of the fact that dilution is conceived as a process leading to a change in the way the molecules of the solvent behave together — a change in the structure of water and a concurrent change in the forces likely to make these structures possible. The particular homeopathic claim that water can ‘remember’ substances with which it has been in contact, and that such memory might be mediated by hydrogen bonds has also been criticised, typically on theoretical grounds. Many such arguments involve the short duration of individual hydrogen bonds in liquid water ( which is about a picosecond). However, it is not to be assumed that the mesoscale structure of water must change on the same time scale. For example, in ice, hydrogen bonds are also very shortlived but an ice sculpture can ‘remember’ its shape over extended periods. (Here our essay assumes a suitbly seasonal feel - Editor.) On a smaller scale, cation hydrates are commonly described with particular structure (for example, the octahedral Na+(H2O)6 ion) even though the individual water molecules making up such structures have very brief residence times (measured in microseconds). Such arguments ignore the fact that the behaviour of a large population of water molecules may be retained even if that of individual molecules is constantly changing, just as a wave can cross an ocean, remaining a wave although its molecular content is continuously changing. Evidence denying the long life of water clusters is mostly based on computer simulations but these cover only nanoseconds of simulated time. Such short periods are insufficient to show longer temporal relationships, for example those produced by oscillating reactions. They also involve relatively few water molecules and small (nanometre) dimensions, insufficient to show mesoscale (micron) effects. In short, they use models of the water molecule whose predictions correspond poorly to the real properties of water. Certain 'memory' effects in water are well established and uncontroversial: for instance the formation of clathrate hydrates from aqueous solutions whereby previously frozen clathrates within the solution, when subsequently melted, predispose later to more rapid clathrate formation. This is explained by the presence of nanobubbles, extended chain silicates or induced clathrate initiators. Can a homeopathic remedy work if it contains none of the original curative substance? But we have to be careful; homeopathy was not the declared, explicit, subject of this text, although it may have been an underlying riddle for Darwin (we know that he visited an homeopath, out of despair about his condition, and felt better after). ‘I find it necessary to allude here to animal magnetism, as it is termed, or rather mesmerism (as it should be called, out of gratitude to Mesmer, its first founder), which differs so much in its nature from all other therapeutic agents. The bottom line is that homeopathic dilution has not been shown o work, but nor yet has it been shown to be impossible. Some will say ‘well, you cannot prove a negative’ which may be true, but clearly the history of science is of things that people rejected as impossible becoming accepted in the light on new and more sophisticated understandings. The same could yet be said for the mystery of homeopathic dilution. On one level, explanations of the placebo effect are couched as the result of complex neurobiological processes. On another level, the placebo effect is considered to entail the mind’s reaction to what some have called the ‘rituals’ of treatment: examination by medical professionals, in the environment of a doctor’s office or hospital, conducting seemingly authoritative yet mysterious procedures, administering officiously named ‘medicines’. The operative word here being ‘rituals’, as if script and stagecraft profoundly matter — leading, according to the mind-body duality, to the body reacting in ways that elicit the desired palliative outcomes. The comment under the picture; would that mean that only if medicine kills that should be called medicine? Thanks for the comments, Keith and Tessa! Yes indeed, I agree with you on both points: the placebo effect is actually a wonderful and important part of medicine, which should be first of all recognised and then secondly, embraced and built upon. Because it seems to improve the actual, real world outcomes of all treatment, whether the treatment is actually doing something or merely seems to. But yes, and Tessa's point is exactly on this, 'real medicine' insists that there should be these physical mechanisms, and there is fascinating research into how the placebo effect is significantly strengthened when the patient feels negative consequences from the treatment. Doctors who warn patients that the drug is 'powerful' and may cause them to feel sick, tired, giddy, headaches... actually seem to persuade the patient that the drug is 'powerful' and thus its curative powers are greater too. Those harmless homeopathic mini pills, on the other hand, advertised as guaranteed to have no side-effects immediately lose a certain amount of credibility in the patients 'sub-conscious' (if they actually favour homeopathy) - and in their conscious 'prejudices' if they don't. This brought to mind a recent article on Hindu science on the BBC https://www.bbc.com/news/world-asia-india-46778879 Not that Hindus don't do good science, but some subordinate it to their belief systems.